"Superb evening in the speakers residence tonight organised by Show Racism the Red Card a fantastic organisation that deserves our unswerving support." Show Racism the Red Card, the UK’s anti-racism educational charity, marked 17 year’s of campaigning and delivering anti-racism education with a spectacular Hall of Fame event on 17th December 2013. The event was hosted by the speaker of the House of Commons, the Rt. Hon. John Bercow, in his parliamentary residence. 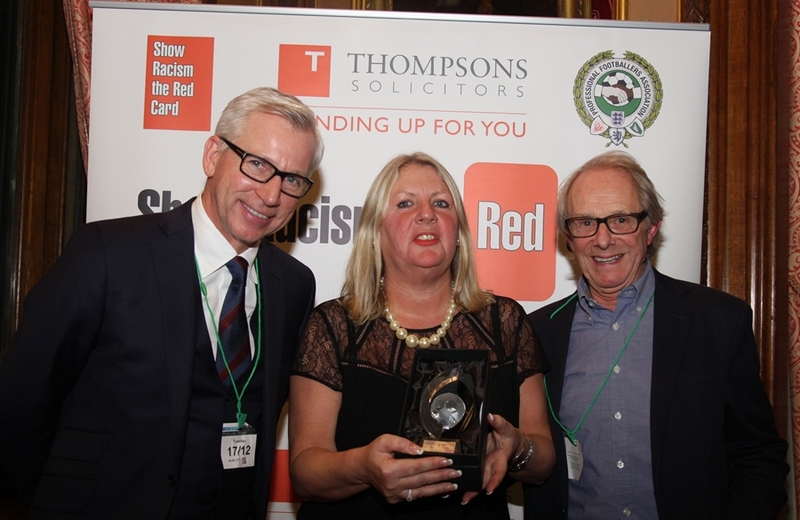 On a night dedicated to recognising the hard work and time that individuals and organisations have committed to working with Show Racism the Red Card, 16 awards were handed out in total under a number of different categories. Newcastle United manager Alan Pardew was recognised along with West Ham boss Sam Allardyce, Norwich's Chris Hughton, and former Scotland manager Alex McLeish. For their contribution to the charity, England's most capped player Rachel Yankey and Everton/England Ladies' goalkeeper Rachel Brown were honoured as well as Wigan's Emmerson Boyce and Crystal Palace's Danny Gabbidon. Former Arsenal favourite Perry Groves was honoured as a role model and was inducted into the hall of fame alongside Premier League Referee Chris Foy and comedian Ava Vidal. Manish Bhasin who hosts the Football League Show and presents the SRtRC educational film and ex-West Brom Defender Darren Moore were also inducted in this category. The inductees were presented awards for their services to the campaign by film director Ken Loach, Chief Executive of the PFA Gordon Taylor OBE and West Ham Legend Sir Trevor Brooking. Show Racism the Red Card would like to extend a big thank you to all of those who attended the event and helped to make it such a success.